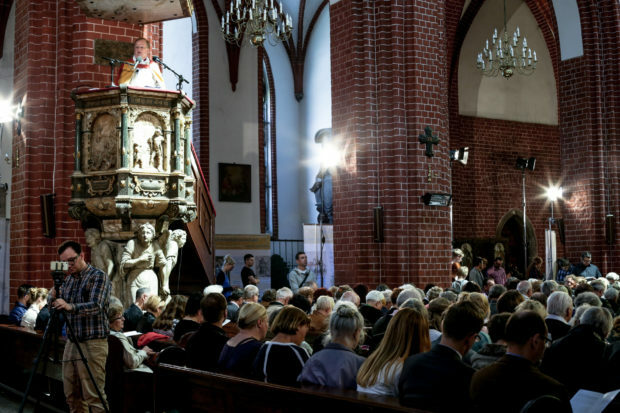 On Sunday, May 14, 2017, there was a Jubilee service of the 500 years of the Reformation in the Church of St. Mary Magdalena in Wroclaw. It is the same church where Pastor Johann Hess gave the first Protestant sermon in Wrocław in 1523. Thanks to the hospitality of the parish priest Peter Mikołajczak, Lutherans and their guests could celebrate in this symbolic place. 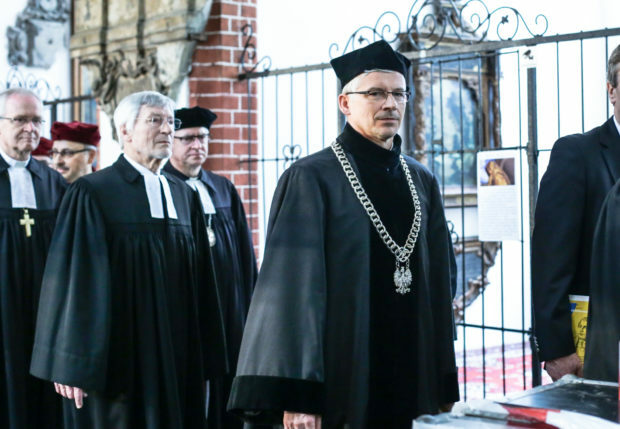 The service began with the entrance of Lutheran clergy of the bishops of the Diocese of Wroclaw, Katowice, Cieszyn and Pomorsko-Wielkopolska and Bishop Ragnar Persenius of Uppsala in Sweden. The service was attended by German Consul Elizabeth Wolbers, Governor of Lower Silesia Paweł Hreniak, Mayor of Wroclaw Rafał Dutkiewicz, Cardinal Henryk Gulbinowicz, Wroclaw Metropolitan Archbishop Józef Kupny, Bishop of the Greek-Catholic Church Włodzimierz Juszczak, representatives of other Christian denominations affiliated with the Polish Ecumenical Council and the Chairman of the Jewish Community of Wroclaw Aleksander Gleichgewicht. Bishop Waldemar Pytel of the Wrocław Diocese of the Lutheran Church said that celebrating this year jubilee is not „500th anniversary” of the Reformation, because it would mean the moment of celebration of Martin Luther in 1517, but the „500 years” of the Reformation, which for 500 years continues uninterrupted. Reformation is the constant renewal of life and the church on the basis of the Word of God. The Church must constantly reform. The world needs a renewed Church, because only that church can testify to the world about the power of the Gospel. The bishop also referred to the history of Wroclaw – the meeting place of many faiths and many cultures. The city, which in the past thanks to the Reformation developed and gained importance, and today is the meeting place, a city open to others. The basis for sermons were the first few verses of Psalm 98, „Sing to the Lord a new song, for he did marvelous things; His right hand and his holy arm have brought him the victory. (…) shout for joy to the Lord, all the earth; Rejoice, rejoice and sing praises! „Psalm 98:1-4. 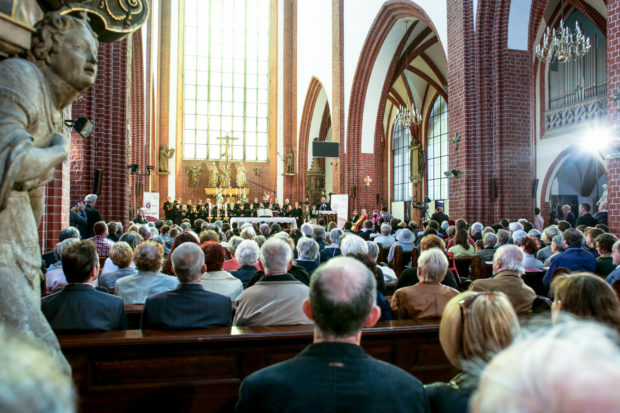 The fourth Sunday after Easter in the Lutheran Church is called Cantate and is a celebration of church music. In his sermon, Bishop Persenius alluded to the words of the Psalm 98. He talked about the joy of salvation, the joy of being Christians; we can express the common singing. People throughout the ages have sinned and sought ways to salvation, tried in various ways to please God, but do not always do it the right way. Such a man was Martin Luther until he experienced the grace that comes from God. It was from reading the New Testament that he learned that the only source of salvation is faith in Jesus Christ. The man does not have to do anything to be saved – enough to believe. This discovery made by Martin Luther, the spiritual legacy of the Reformation, can be found today in many churches in the world. Justification by grace through faith and not by works – an issue that once divided Catholics and Protestants – was confirmed in the „Joint Declaration on Justification.” Fifty years of Catholic-Lutheran dialogue began to overcome the divisions of 500 years ago. We have so many reasons to give thanks to God, to praise Him in song and music. To hope and to bring hope to the world. 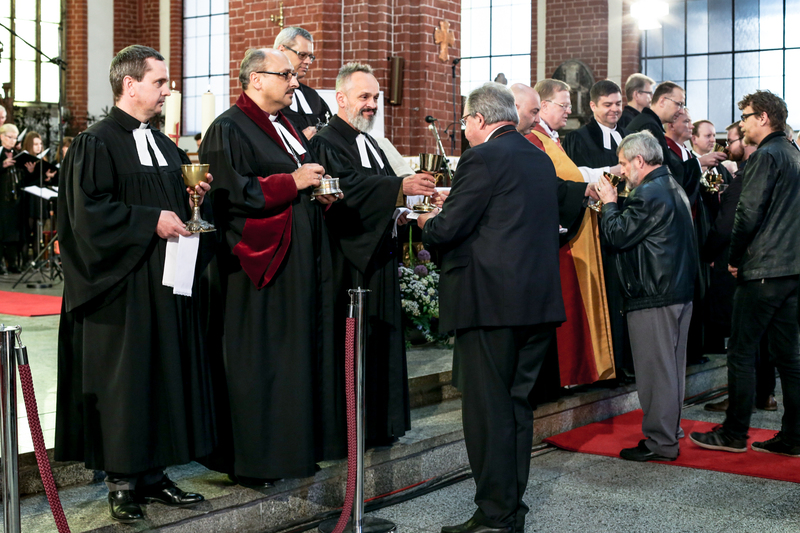 After the sermon, there was communion, which was led by Bishop Waldemar Pytel and Bishop Ryszard Bogusz and many people many people participated. There were greetings from Wroclaw Catholic Metropolitan Archbishop Józef Kupny. He reminded the congregation of the document „From conflict to communion,” or in other words „unity” developed by Lutheran and Catholic theologians. It does not overcome the doctrinal disputes between the two faiths, but is an attempt to seek unity. The words „from conflict to communion” can also specify the relationship of the two religions for the past 500 years. The service ended with a final blessing, Bishop Waldemar Pytel gave for „all the days of life and for the next 500 years”. 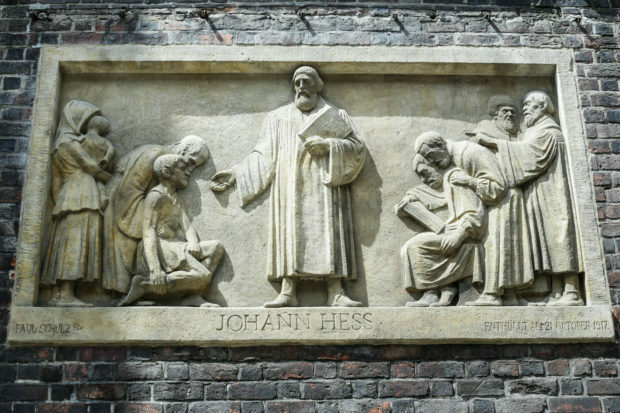 After the service all attendants went to the rear of the cathedral for the ceremony of unveiling a sandstone table of reformers, including Johann Hess. The table was embedded in the wall of the church in 1917 – to celebrate 400 years of the Reformation. Immediately after WWII, as with many German things, the display was almost destroyed. Thanks to the restoration, the reformers on the plate regained their faces, dignity and rightful place in our memory.